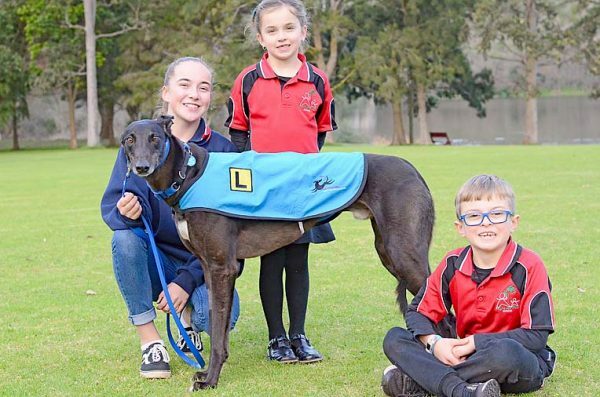 PERFECT PET: George the greyhound is taking part in the Greyhound Adoption Program SA’s Foster To Adopt program thanks to owners Lee and Steve Bartholomew and their grandchildren Paige Hicks, Cameryn and Koby Bartholomew. FROM racing to retirement the Greyhound Adoption Program SA (GAP SA) is helping turn hounds into house pets with its You. Me. 6 Weeks and Foster To Adopt programs. On the lookout for foster carers in the South East, GAP SA will visit the region next week to meet with program stakeholders.